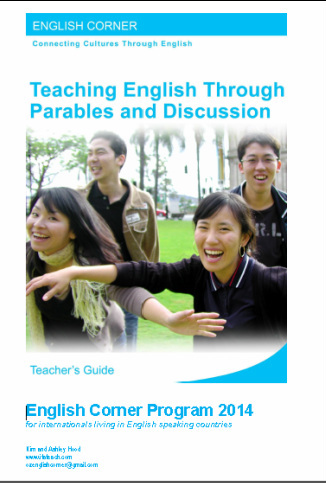 English Corner Lessons - Teaching English Through Parables and Discussion. Interspersed thoughout these series are one-off stories linked to holidays like New Years Day, Australia Day, Anzac Day or Sorry Day just to name a few. The large group is broken up into smaller groups, each with a teacher/facilitator. These can be divided into different English levels or can be run as mixed-level groups. Lesson: Discussion questions that provide the students with many opportunities to speak, finishing with a verse from the Bible or acting out a Bible story. The students come back together in a large group where there is a brief comment/summary activity about the lesson, interview students who are leaving and announcements about up coming events etc.